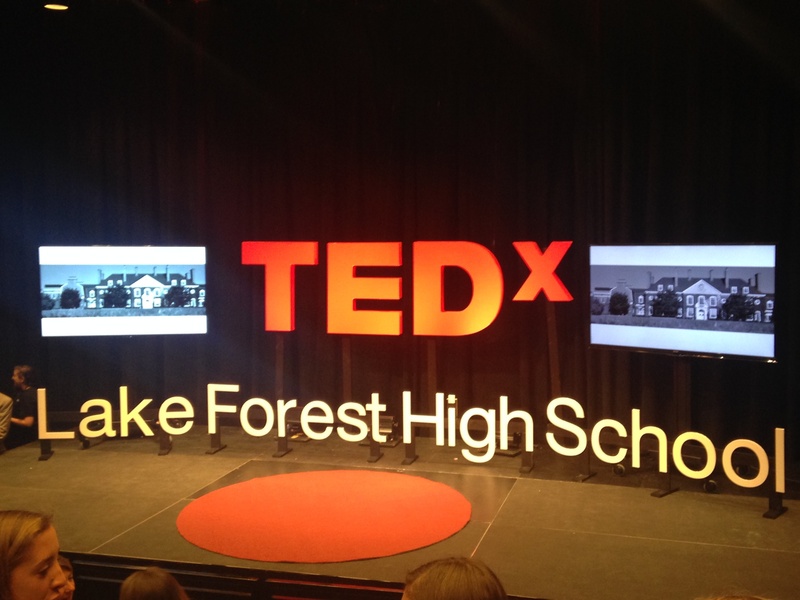 TEDxLakeForestHighSchool dropped on Thursday, April 16th – and all things considered, the event was a huge success. Months of planning culminated in 16 students and 9 community adults gracing our stage, inspiring our small audience, and hopefully starting conversations that matter. Talks included how students would reinvent the high school classroom, LGBT representation in the media, and the reality of reality. I’m especially proud of the students and the work they put into delivering a successful TEDx Talk, and I’m pleased to have played a small role in supporting their ideas and passions. Consult the manual at all times. If there’s a question to be answered, the manual will point you in the right direction. Here’s how most of our ideas went: I think we should do this -> Let’s try it! -> This doesn’t work at all and is a huge disaster -> Okay, let’s take step back and figure this out -> We’ve nailed it! Be flexible, evaluate everything, and be prepared for evolution. Our stage design radically changed two days before the event, which on paper sounds like we didn’t know what we were doing. But in reality, we received good suggestions and feedback late in the game, realized they were great suggestions, and altered our plans. Be prepared for many small details that pop up at the tail-end of planning. Stay cool, and dish them off to the right person. Reach out to sponsors as soon as you can, and have a package firmly outlined. We met many awesome, excited people, and it was a joy to establish relationships with community members. Read the sponsor rules in the manual carefully (it starts on page 36), as there are many. Find people that are awesome at what they do and enlist their help. We worked with talented adults and students to help with sponsor outreach, event planning, graphic design, signage, printing, media production and stage design – amongst other areas. If you have a red, circular rug on hand – even if the color doesn’t perfectly match the TED red – use it. Be as clear as possible with what you want from the speakers. Communicate the expectations, and do your very best to work with the speakers to follow through. Not everyone knows what a TED Talk really is, and not everyone is cut out to take your stage. Form a speaker committee and carefully vet and select your speakers. Rehearse, rehearse, rehearse. Work out your tech bugs beforehand so you don’t have any surprises the day of the show (we had audio/mic problems…these will be carefully sorted out and resolved for future events). 100 invites goes SUPER fast. Between interested students, parents, sponsors, speaker coaches, and school administration, our 100 invites vanished in a hurry. Don’t over-promise, and be as upfront as you can about the official guidelines of your TEDx event. Pay money for a cool website with professional features. I recommend Weebly – it’s very user friendly and easy on the eyes. Try not to stress the small stuff. I lost far too much sleep over the t-shirt designs turning out well (happily, they turned out great). In the end, it doesn’t matter. Do you have motivated students, food and a stage? You’ve got the essentials covered. Over-order the t-shirts. I didn’t order enough smaller sizes and was sheepishly handing out XL shirts to 5’4’’ girls. When in doubt, order a few more – they’ll help in the promotion of the event, are nice keepsakes for event volunteers and people that assist in the planning, and freshman girls won’t be stuck with t-shirts that double as nightgowns. Watch out for old press releases – an eight-week old press release popped up in a newspaper the day before the event, and that press release listed a different start time. There’s not much you can do about this (issue an updated press release? ), but be prepared. Is your TEDxYouth event being held in a school? (Probably yes). Are there annoucements in the middle of the day that might interrupt a speaker? Plan for that. We didn’t. Are your TEDxTalks part of a class project? In the weeks leading up the event, allow class time for your student speakers to practice their Talks in front of classmates. Our student speakers were remarkably well-prepared, and many of them practiced delivering their Talks numerous times in Joe De Rosa’s social studies class. It helped immensely. Try to enjoy the show. If you’re a program director, you’ll likely be running around and not fully soaking up the inspirational Talks on stage. Take a moment, breathe, and enjoy a Talk. Rehearsals may be your best chance to fully embrace the flow of the show, so take advantage of that opportunity as well. Find trustworthy student volunteers, and let them handle the lionshare of the day-of-event management. They will make it their own. A TEDxYouth event is all about the students – both on-stage and behind the scenes – give them the ball and let them run with it. Dish out the thank yous, and don’t stop. There are many people that make an event a success, and they deserve to be thanked profusely. Relish your success. We’ve heard so many nice things and have gotten so many nice emails from students, attendees, teachers and administrators – it’s really quite something. It’s easy to get lost in the things that you wished had gone better/differently, but try and focus on the positives. We delivered an event that will be a lasting memory for these students, and we also provided a platform to move forward with their ideas and passions. And, really, that’s the most important part of the entire process. Previous Post We gamified a Google Search PD session, and it was awesome!